Since I started eating ketogenic, it's opened up a whole wonderfully naughty full-fat world for me to revisit the beloved recipes of my youth that I stopped eating because I was part of the low-fat craze for so many years. Thank goodness that's over! do you remember the singular pleasure of Lay's caramelized onion dip in the pop-top can? Me and my girlfriend Beth used to crush a can in about 5 minutes flat right along with a whole bag of Lay's sour cream and onion potato chips. Don't judge, we were 16. The combination is so addictive that even today I still yearn for caramelized onion dip on the regular but without the artificial flavors and preservatives. So I thought, why not recreate the onion dip of my youth but in its pure unadulterated form? It's got all of the good fats and all of the yummy flavor, so let's do this! This recipe needed very little tweaking to bring it over the top. The main thing is that I highly recommend you make your own mayonnaise. No surprise that store-bought mayo is most often (still) made with highly processed Franken-oils like canola oil that are downright BAD for you and cause inflammation. My mayo recipe tastes just like Hellman's and takes literally 5 minutes to whip up in the blender. Link here for the recipe. While you're gathering your ingredients, stop by Trader Joe's to pick up some TJ's Parsnip Chips, too. While you're gathering your ingredients, stop by Trader Joe's to pick up some TJ's Parsnip Chips, too. Just between me and you? Parsnip chips are a 40-something-on-keto-who's-craving-something-crunchy-girl's best friend. 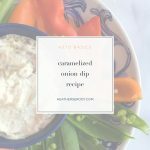 Especially if you're making this onion dip. It actually tastes even better than onion dip & chips ever did way back in 1986. Heat butter and oil in a cast iron skillet on medium heat. Add onions, chili flakes, salt, & pepper and sauté for about 10 minutes or until translucent. Reduce heat to medium/low and cook onions for another 15-20 minutes, until caramelized. Remove onions from pan and drain on a paper towel. Place cream cheese, sour cream, and mayo in a medium bowl and mash with a potato masher until well combined and smooth. Add onions & mix well. Adjust seasonings to your taste. 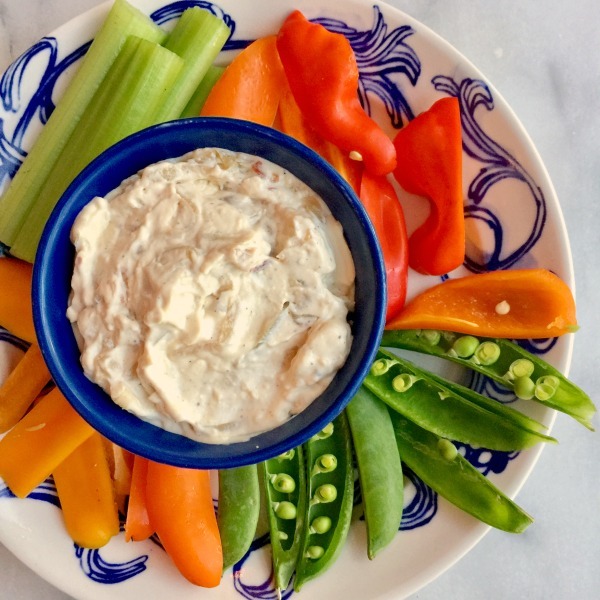 Serve at room temperature with crudités or trader Joe's parsnip chips. Yummy!